The Moment, designed by artist Damian Vick, is a striking, hot dip galvanized and painted sculpture installed five meters above ground on a South Melbourne apartment building. Located in Melbourne’s premier arts precinct, the sculpture was primarily constructed from 3mm mild steel and mounted on an angle frame. It weighs three tones, measures seven metres in diameter and 2.4 metres in depth. The council brief was to supply a standout artistic feature for the building, which is located in the heart of Melbourne’s arts and culture hub. The complex design of The Moment included 49 individually hot dip galvanized sections, finished with a red Duplex coating. The Duplex finish ensured a vibrant, durable coating that provides longevity in Melbourne’s varying weather conditions. The Duplex system applies a paint finish to a hot dip galvanized coating. This safeguards against corrosion of the steel substrate, which could lead to rust staining and detract from the final painted finish of the sculpture. The extremely odd shapes that make up The Moment required precise jigging to ensure there was no build-up of zinc on the inside and outside surfaces. 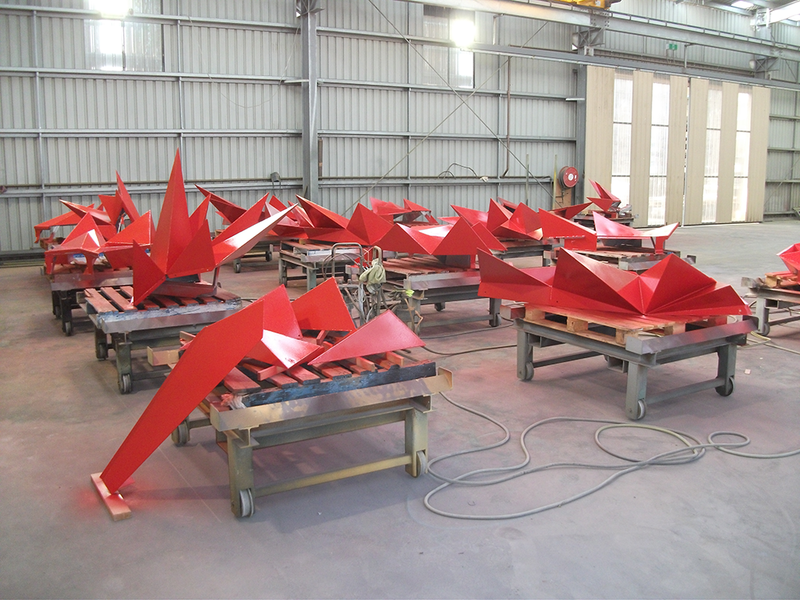 Geelong Galvanizing employ a dipping technique that is accordance with AS/NZS 4680 to ensure a sufficient coating thickness on all surfaces of the odd shapes. Adequate venting/draining was put in place to remove the chance of wire or touch marks detracting from the overall façade. The thin gauge of steel used, meant that care with quenching was critical to ensure no distortion occurred. As any deformation would have made assembly of the work virtually impossible. Each piece of the sculpture was individually wrapped and shipped to ensure no damage occurred during handling and transport. The sculpture was delivered, ready for installation. Duplex coating systems offer cost benefits for a wide range of projects that require a painted steel finish. The base hot dip galvanizing coating for this sculpture cost the client around 75% less than a comparable three coat paint system, which would be required to offer an equivalent level of corrosion protection. This offers significant cost savings for the client.